Ever since Mason was pretty little, he has loved playing chess. My dad loves chess as well and the two of them have bonded over a chess board many times. My dad is a history teacher. One year, my mom made him a beautiful, hand made chess board with the pieces in the shape of civil war soldiers. This set is glass and fragile. My dad keeps it packed away safely and only brings it out to play when Mason is there. Mason is the only one allowed to play with it. It's a special thing between the two of them. Whenever Mason goes to see my parents, the first thing he wants to do is play chess with Grandpa Scott. They've created many memories this way. Last year, Mason played in the chess club at Jefferson Elementary in Idaho. 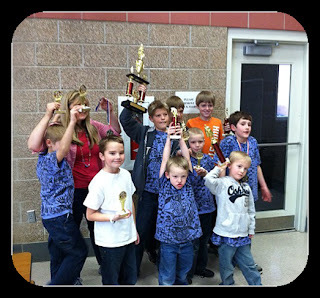 They held one tournament and Mason took 1st place. This year, he joined the chess club at Saratoga Shores, but things are a little different here. This chess club has many more players and competes in many tournaments throughout the area, against a lot of other schools. Mason was excited to be able to do this. 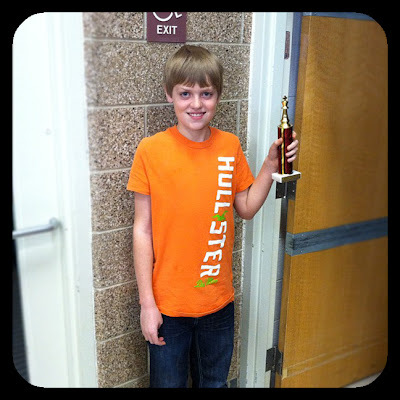 Unfortunately, the chess tournaments are on the same days as his basketball games, so he wasn't able to attend most of them. His coach wanted each player to attend at least one, and recommended the Riverton Tournament as the one she would most like them to attend. We let him miss one basketball game in order to do this. Saturday was the big day. Mason was up and ready in plenty of time for us to leave at 8am. We arrived about 8:40, with the tournament scheduled to start at 9. After locating his coach and school, we found his first pairing and he went into round 1. I stayed outside and visited with the other moms. He came out of round 1 with an unreadable expression on his face. He made his way to me and told me he had won his first round! He was so excited! This put him in the winner's bracket though, so the next rounds would be more difficult. Mason went into round 2 around 10:30 or so. Unfortunately he lost this round. I think this surprised him, since he wasn't used to playing with this much competition. He was pretty disappointed. One of the boys brought a 4-player chess board. Between the rounds, Mason and 3 other boys would play it. He thought it was incredibly fun, so it took his mind of his loss a little bit. Round 3 began around noon or so. Mason came out with a sad look on his face and told me he had lost again. He had set a goal for himself to place and get a trophy, so he was feeling like this was now out of his reach. However, his coach pulled him aside and told that since he had been paired up with some high ranking players, if he won the next 2 rounds, he would likely still place. This gave him some hope. Going into round 4, I was nervous for him. I knew he really wanted to win these last 2 rounds. The competition was stiff though. There were 29 schools and 240 players competing! He came out of round 4 with a smile and a victory. Now he knew he still had a chance to place, if he could come away with a victory in the final round. Mason went into round 5 around 3pm. A few of the other kids came out first and I was so nervous for him. He finally emerged and I could tell by the look on his face that he had won! Now we just had to wait. He had 3 points. But there were a lot of players with 3 points. It would all come down to who had competed against players with higher rankings. After they did the awards for the younger kids, it was Mason's turn. First they awarded the medals for those who didn't place. We were happy when he was still standing after that. Then they gave out smaller trophies for those who had done very well but not placed. Once again, his name wasn't called. At that point we knew he was in the top 10, but we didn't know where. When the results were in, Mason placed 6th. He got a nice trophy. There aren't many times I can remember him being so excited and proud of himself. It was so fun to be able to watch him. We are so proud of him, and Grandpa Scott made sure Mason knew just how proud he was as well. Mason's team took 10th place out of 29 schools. Mason's points were a big contributing factor to that. They were very happy to be able to get a team trophy as well. Here's a little pic of the team with their trophies and medals (and yes, we forgot to have Mason wear his team shirt- oops). Great job Mason! You're awesome!